Non-irradiated, sulphur-free roots are used in the making of this tincture. 30-60 drops, 2-3 x daily. I purchased danshen red sage in an 8 ounce bottle and am using it at 60-70 drops 3 times per day, so roughly a little over 2 teaspoons per day. I bought it because it’s part of Stephen Buhner’s core protocol for re-modulating inflammatory cytokines, protecting lymph nodes, and helping G.I. good bacteria. Over 2 months of use I can say that it has been helpful in feeling better in my battle with Lyme disease. It does lessen pain by blocking Lyme bacteria from inflammatory actions. I use with Cat's Claw, Chinese Cat's Claw, and Japanese Knotweed. 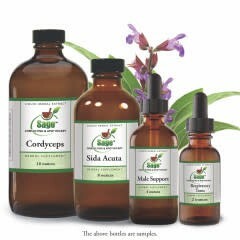 I recommend this product and thank Sage Woman for producing it at a reasonable price.